It is common to see hikers simply throw on a pair of their running shoes to go on a quick hike. They see the shoes more as “exercise shoes” rather than shoes that cater to specific purposes such as, hiking, running, rock climbing, or biking. 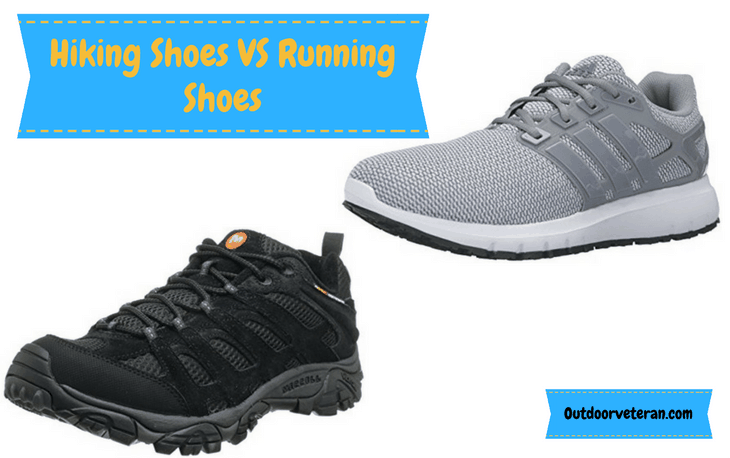 However, are there key differences between hiking and running shoes? Are there differences large enough that you should purchase two separate pairs? Choosing the right pair of shoes to put on when taking a hike or when going for a run can be difficult. By understanding the key differences between hiking and running shoes, you will be able to be knowledgeable in making a proper shoe purchase. We all want things that are durable and there is no exception when it comes to shoes. Hiking shoes are designed to face the rough terrain for hundreds of hikes and barely show any wear or tear. It has been said that hiking shoes can last up to 1,000 miles of hikes! Running shoes, on the other hand, can last up to 500 miles. They are not designed to face the tough terrain that hiking boots meet and you will probably need to replace them after the 500 mile mark to avoid damaging your feet from excessive wear. There is a principle that essentially says, weight on your feet uses up more of your energy than weight on your back. With this in mind, it is crucial to make an investment in shoes that minimize your energy consumption. Hiking shoes are usually heavier than running shoes, depending on the specific type of shoe. The weight of a hiking shoe comes from adding the durability mentioned above. However, if you are still wanting a lighter pair of hiking shoes, take a look at leather boots, which are lighter than the suede option. Running shoes are designed to be light and not take any unnecessary weight or energy from you. The design and sturdiness of hiking boots makes breaking them in necessary. Failure to properly do this will lead to a painful, blister-filled hike. Break in your hiking shoes by wearing them around your house, quick walks around the neighborhood, and then progress to short hikes. On the other hand, running shoes have a different design that makes them less sturdy, allowing them to be broken in easier. This means that you can put them on for a run without breaking them in. Hiking shoes practically guarantee full protection of your feet. The soles of hiking boots are made from thick materials, which makes them tough and durable when walking over rocks and branches. Additionally, hiking shoes have higher ankles compared to other types. The advantage of this is that your feet will have support and are protected from ankle sprains. However, you might lose your footing due to the thick soles since you would be higher off the ground. Running shoes, as previously mentioned, are made from lighter material, which means that their soles are also light and less durable. Since they are designed with weight in mind, they will no be as protective as your hiking boots. Another thing to note about running shoes is that they do not also have high ankles, allowing you to get a bad ankle sprain. Lastly, you will want to make sure that your hiking boots are waterproof. Most, if not all, hiking boots have materials that keep water from leaking in. The waterproof material makes it possible for you to take a hike in rainy season or walk through puddles on your trail. Running shoes have waterproof material but the level of protection they offer on the leakage is much less. While running shoes are not waterproof, but are made with lighter material, they will dry faster than hiking boots when they get wet. So, while most people do not know the differences between hiking and running shoes, you will. While it is possible to use one pair of shoes for both activities, you are making it much harder on yourself than it needs to be. By buying shoes based on the durability, weight, breaking-in ability, protection, and waterproof level, you will be able to excel all the more in running and hiking since you will have made an informed decision. In order to be at your best, you have to have the shoes that help you get there. Hiking Vs Trekking: What are the Differences?